My 3rd card didn't come into reality until after midnight, but I'm posting it anyway, because I think it turned out very striking, and a good way to start out February, black, red and cream. You will be seeing Christmas cards every month because I'm going to try to be a loyal poster to Bah! Humbug! I'll have my Christmas cards made and be able to concentrate on other fun activities. Supplies: Cream Card Blank 5" X 6 1/2" Halcraft, Papers: Hobby Lobby-Magic of the Season Paper Pack, red crinkly unknown, Stamps: See-D's-Christmas Messages#50319, Ink: Ranger Archival Ink-Jet Black, Stampin Up-ornament punch, Martha Stewart-embossed trefoil heart punch, gold craft cord, ribbon-Hobby Lobby, Sharpie Paint Pen-gold, pop dots. 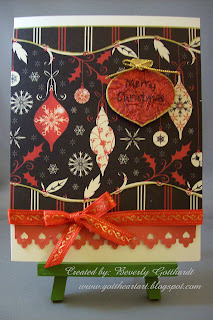 Another gorgeous card Beverly - love both the layout and papers. So pleased you intend to join us every week at Bah! Humbug! I can't believe I've already got quite a few cards done - it's just gonna make next Christmas so much easier. great idea to do a Christmas card... now you'll be ready for next year! THanks for playing with us at SR! Great card! Way to get a head start on your Christmas cards :-) I love it. Thanks so much for playing with us at SR! Another fabulous card Beverley, I love the papers and your bauble is gorgeous. Thank you so much for joining us again at Bah!Humbug. Great Card! The glitter really makes it shine! Thanks for playing along with us at SR! Super card again Beverley. No wonder you like those papers - really striking. Thanks for joining in at Bah! Humbug! this week. So nice to know you are enjoying our challenges. OK WOW!!! This card is great. I love all the little details. Thanks for playing with us at SR.
Oh this is stunning!! just found your link in the comments so sorry i am late.